“Hey, I NEED RAE DUNN! !” Kara texts me late Saturday morning. “Rae Dunn? 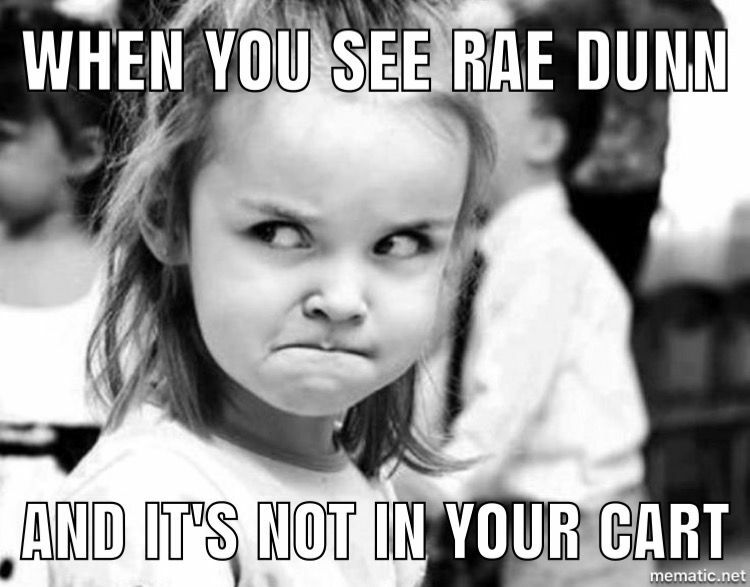 What’s Rae Dunn?” I replied, confused as to what she is talking about. While I lay in bed this fine Saturday Morning, (yes, I’m not even up for the day yet), I smile about this treasure hunt my girlfriend has pursued full force. She literally went to HomeGoods 3 times last Monday and at one point stayed in the store for over 2 hours hunting for Rae Dunn pottery! Last Friday she was there for 4 hours! Kara is a loving mother, wife and entrepreneur in the skin care industry. She lives a well-balanced life with her beautiful family of 3 and works hard daily at everything she does. Could this Rae Dunn epidemic be her heroin or is it her saving grace? Is it an obsession? Or is it simply a community of women seeking affirmation in their daily dose of coffee? I’m curious and I have to know what this craze is all about! If you’re not familiar with Rae Dunn already and you’re asking yourself the same things such as, “What is this fanatical craze all about?” , then you’re in the right place. These pieces can be found at Tj Maxx, HomeGoods, and Marshalls, or through re-sellers online. The downside to buying through re-sellers online is that they generally inflate prices because these products are so exclusive, with minimal supply and high demand. This is one hot interior design trend for 2018! Especially if you’re going for the farmhouse interior look. Later that week, I messaged my girlfriend about grabbing lunch Friday and proposed the idea of interviewing her to write about this rising epidemic for Rae Dunn. “A Dunner? Like Rae Dunn Dunning?” I ask. “YES!! !” She responds as excited as ever. “You are so funny! Tell me when and where and I’m there!” I quickly replied. I was so excited to get the scoop on this new addiction of hers. “Meet me at the HomeGoods in Tualatin at 12:00pm, I’m meeting someone to make a trade,” Kara states. As I approach HomeGoods Friday at noon, my curiosity grows stronger. Once Kara and I found each other, I had just missed the trade. “How’d it go? Was it weird trading with her outside of the store like this?” I asked. “No! Not at all! It was easy,” she responds. Kara already had her cart and was ready to roll. I followed her closely as we went up and down each isle meticulously looking for any large letter anything. As we turn the corner to go down the next isle, still on the hunt for this exclusive product, we run into one of Rae Dunn’s biggest community supporters, Jamie. She too, is a loving stay at home mother and owner of the Facebook group, “Rae Dunn B/S/T Portland, Oregon.” This is a closed Facebook group with 1.2k members. The only rule for being associated with this group is that no one can sell or trade Rae Dunn products for more than retail in order to attract true collectors; not someone who is only looking to make a buck. I introduced myself to Jamie, and told her about what I was out doing with Kara, writing a story about Rae Dunn. She was amused and the 3 of us start talking. “My kids go to school from 8:00am – 2:00pm and during that time, I schedule meetings for trades, and come here to shop HomeGoods. Openings are best if you’re really trying to get your hands on product.” Jamie Says. “Do you have meetings for trades every day?” I ask curious as to how committed she is to this brand. “Do you buy only what you need to complete your collection and give others a fighting chance?” I ask. She responds saying, “I recommend you buy extras so that you have pieces to trade with. You can easily miss an opportunity to get what you want at the store." I wonder what their husbands think?! “What do your husbands think of this new found hobby of yours?” I ask. What I’ve learned thus far is that Rae Dunn isn’t just some sort of fanatical craze. It’s about the playful treasure hunt. Not only is it fun and competitive, there is a whole community of women working together to complete their collection. The white on white design featuring on trend minimal style that is crisp, clean and classic appeals to most of us. This pottery provides function and can also be used as décor. Perfect for the farmhouse interior lover! Lets not forget about the words either! Whether they are descriptive or positive and affirming, they are fun for the whole family! I thank Jamie for answering my questions and we head our separate ways. Kara and I check out and head to lunch. We didn’t find any Rae Dunn while we were there; but I found oh so many home staging treasures and a great story too! Image of Kara & Travis holding their favorite Rae Dunn mugs. “Do you have any shopping experiences you’d like to share?” I asked Kara, expecting some sort of horror story such as: “this woman snatched a pitcher out of my cart!”, or something along those lines. But what Kara says next seriously warms my heart. Isn’t that the most adorable story you’ve heard all day!?! If you’d like to know more about her skin care consulting, you can contact her through Facebook and instagram here.